On the slopes of a hill, within the cluster of houses, there was an unusual spectacle of parked vehicles outside a house. This spectacle indicated a gathering. People were coming and going. At the centre of the gathering was a grief-stricken middle-aged man. The people, who were coming to condole the death of his son, were making an effort to console the devastated man. 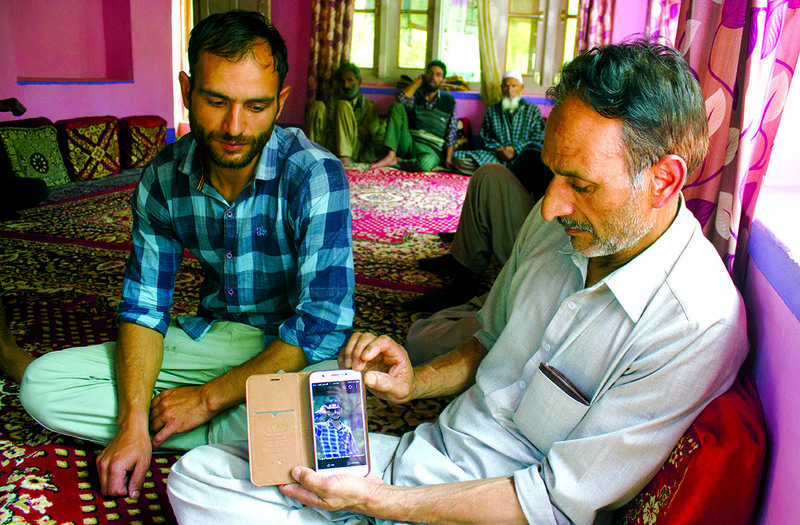 A resident of Zoogu Khairan Beerwah, Bashir Ahmad Ahanger, lost his son Wajid Ahmad in an explosion when a live shell exploded in Tosa Maidan on August 12, 2018. A student of the B A final year, 21 years old Wajid had gone to Tosa Maidan to meet his brother Rameez Bashir, who had trekked to the meadow to celebrate the six-day festival of Jashan-e-Tosamaidan on August 8, 2018. Various public-spirited organizations in association with locals from the cluster of villages – Lutheran, Drang, Shunglipora and Khag, have been celebrating the festival since August 2014 with thousands from all over Kashmir attending the festival. That year, the breathtaking meadow was freed as one of Kashmir’s fierce target practice ranges. Wajid was concerned about his brother. There is no phone connectivity in that area, so he went to meet his brother, almost 8 km away. He rented a horse, took a bath and left on August 12. As Bashir was detailing his worst incident ever, perhaps umpteenth time since he laid him to rest, Waji’s brother Rameez, sitting right next to his father, broke the goriest of the details, the firsthand account. From Khag, they drove to JVC in Srinagar. As they drove, Wajid kept talking to his brother and the words were unleashing as a torrent in him. Rameez knew Wajid was breathing his last. “I told him I will give him my whole blood to save him. But he left us,” he said and broke down. The blast left two others – Waseem Ahmad Ganai son of Abdul Majeed Ganai and Mudasir Ahmad Ganai son of Ramzan Ganai, injured. Both of them are battling for their lives at the SKIMS. Both of them are residents of the same village. Tosa Maidan was used by the army as an artillery firing range for several decades. It was handed back to the state government in 2014. The meadow is approximately 11,200 hectares and though the main simulated range is only 1,809 hectares, the forest has been scarred by frequent firing. Shells are found everywhere and it’s the first time in 50 years that used shells have been collected. In 2014, the army launched Operation Falah (Welfare) to clear the meadow of unexploded shells. It was only after that the picnic spot was officially thrown open to the public by the government. With robots and politicians, after the army generals clicked a series of pictures, the sanitisation was over. Police, however, said the army has not given a certificate that the area is shell-free. “The soldiers used all types of mortars. There were heavy mortars, bonfires, RTs, launchers and air cells. But in 2014, when the army launched Operation Falah to clear the unexploded shells, after the clearance, there was no incident reported until recently when we were celebrating the Jashan-e- Tosamaidan,” said Mohammad Akram, who is part of the Save Tosa Maidan Front. “Every year we celebrate the festival at the same place. The mortar shell that exploded recently was new, having 30 years of experience I know how it looks like,” said Akram, another resident and an activist. Right near the site is a mobile seasonal school camp where around 70 children are provided education. These kids belong to the families who primarily function as shepherds, migrating to the meadow with livestock from May to September. The local people around that area educate their kids in the mobile camps. The entire cluster of villages was living a life of war for last more than half a century. They were desperate to stop the firing. Tosa Maidan Bachav Front (TBF) was initiated by these villagers with the core purpose to protect lives of people in this belt from firing range practices. They are now seeking investigations into the Sunday explosion. On June 24, 2016, RTI volunteers went to Tosamaidan and took photographs of these live mortar shells. To ensure these pictures were authenticated and taken around that particular date, they kept a copy of June 24, 2016 edition of Greater Kashmir newspaper just adjacent to the live shells. These photographs were submitted before the National Green Tribunal (NGT) as evidence. The National Green Tribunal (NGT) had directed the Army through the Ministry of Defence to ensure that the meadow is cleaned before August 10, 2016. “The Ministry of Defence earlier submitted before NGT that they have cleared the meadow from firing equipments and disposal in 2014 under its Mission Fallah. The counsel of Defence Ministry further stated before the Tribunal (NGT) that they would clear the entire field from any waste and explosive remnants expeditiously and in any case not later than August 10. This order was not at all respected and not a single team visited Tosamaidan until the whole meadow became inaccessible due to recent snowfall. The fresh blast that killed a civilian has exposed the claims of Defence Ministry,” the RTI Movement said in a statement.